For most people, the idea of storage, especially self-storage units, is fairly straightforward. You rent a unit, throw your stuff in, out of sight, out of mind, right? Wrong. There is actually quite a bit that goes into storing your belongings, when you sit down and think about it. Whether you have thought about it or not, chances are there are still some secrets to self-storage that you just didn’t know about. 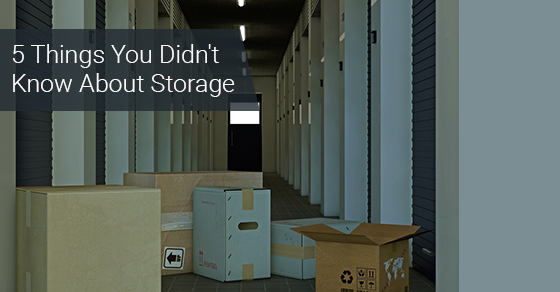 Below are five unheard of storage facts. Like everything, the concept of self-storage units has a history. Self-storage began around 6,000 years ago in Xi’an, China. People would gather up their belongings, including family heirlooms and valuables, take them to what was essentially an underground pit, and keep them there to free up spaces in their homes. The idea of a business purchasing land and creating individual, secured storage spaces for tenants to rent out on a monthly or yearly basis is not that old of a concept. The first company to do this was Lauderdale Storage, in Fort Lauderdale, Florida, which opened in 1958. Since then, all manner of self-storage facilities have opened up around the world, specializing in different services, and offering different sized spaces to their clients. By a long shot, the people who store the most stuff in self-storage units are Americans. American’s are the world’s biggest hoarders and accumulators of stuff. Roughly nine percent of all American households have at least one self-storage unit. There are around 48,000 primary self-storage facilities in the United States, which really puts the size of the industry in perspective. You might think that people only use self-storage to store their belongings, but you’d be wrong. Individuals and families certainly make use of self-storage facilities, but in addition to that, many businesses run their operations out of self-storage units. It is not uncommon for businesses to keep important documents and inventory in self-storage and there is a whole legion of people who buy and sell repossessed storage units as their primary source of income. In 2013, the self-storage industry in the United States was worth nearly 24 billion dollars. The industry has actually been the fastest growing sector of commercial real estate since the mid-seventies, and even saw growth during the latest recession which began in 2008. While the above information might not exactly be cocktail party conversation, like anything, there is always more than meets the eye. Self-storage has a long history, self-storage units are used by entrepreneurs to run their business out of, there are millions of people who use self-storage around the U.S., and worldwide, and it is a multi-billion dollar industry. Bet you didn’t know all that.